Barry Hilton - I was originally attracted to paint this regiment because they had unusual orange facings. Well in 1992 when I first discovered the joys of the period that was pretty unusual! For some reason I and the gang got into habit of calling them Prinds Jorgen’s which is not I think correct. No idea where that came from. They are a unit which people seem unable to make their minds up about the uniform colour. Sapherson has them in pale green faced orange till 1701 with officers in reversed coats and in grey faced orange thereafter with officers in red faced orange. I have seen several other descriptions. They served in Ireland as subsidy troops for the Dutch and also served in Flanders. They were active during the War of the Spanish Succession. According to various sources their flags also changed. I have fielded them both with different standards over the years. 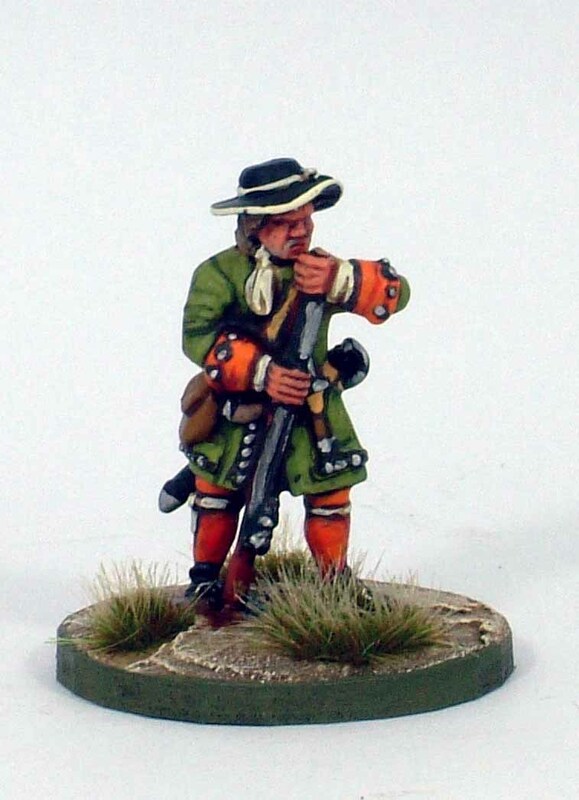 The Danes were an early adopter of 'all musket' battalions. 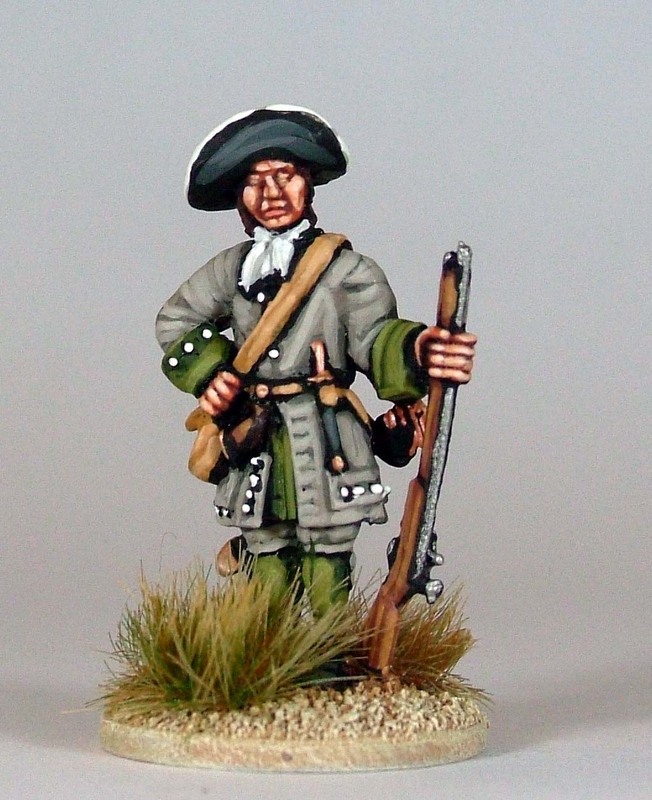 In Ireland in 1690 the Danish infantry carried no pikes. In BLB, the firepower advantages of such battalions are clear although they are vulnerable in melee especially against Horse opponents. They first appeared in my collection when I painted them in 1992. Painted using my preferred black undercoat method of the time, they got spruced up and lost their blue neck cloths when I redid the original Mackay's along with about 6 other early collection battalions in the late 90's. This smartening process involved making the colours more vivid than the originals. As Prinds Jorgen they fought 60 recorded actions achieving three distinctions. Their average battle losses were 21%. 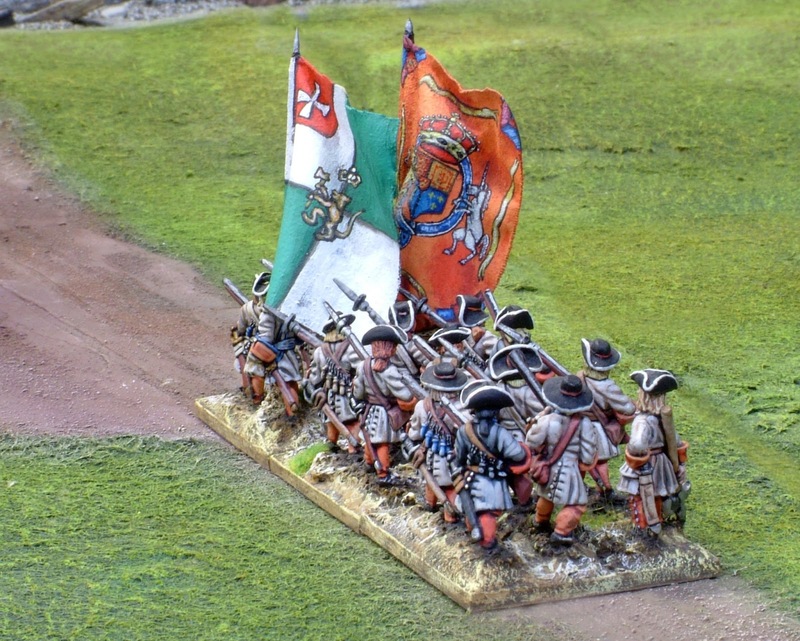 They took two enemy colours; those of the Swedish regiment Bjornbergs during a GNW game and those of the Larequi Cuirassiers. Their own colours were lost six times. 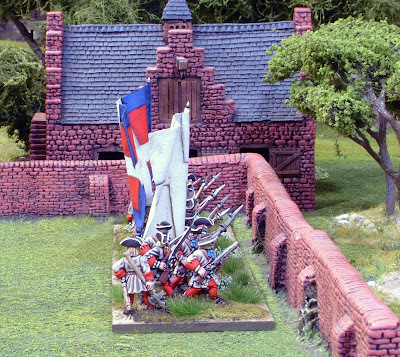 Their Finest Hour came in a refight of Ramillies 1706 which was staged for the Kirriemuir Wargames Club back in about 1995. They engaged and captured the colours of Spanish Cuirassiers (Larequi) in only the second such incident I've seen in nearly 100 games. Their Darkest Hour was losing their colours to Irish Cavalry whilst trying to cross the Boyne 1690. Colonel's colour is actually the English coat of arms on Orange representing William III. Slightly ignominious end to their career as Danish infantry came when I needed French troops for some photo shoots during the creation of Beneath the Lily Banners 2nd Edition. I changed their facing colours from orange to red and pressed them into French service. 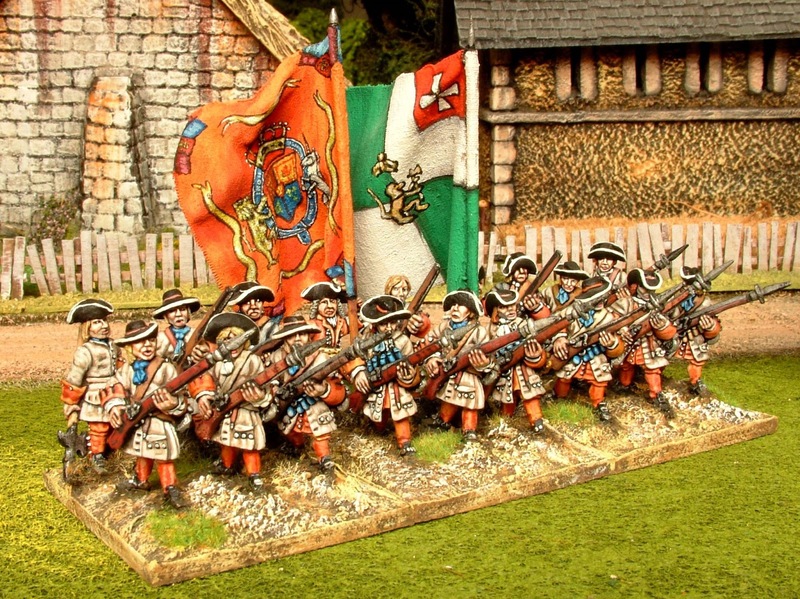 They can be seen in BLB2 on p32 and in the example game at the end as Regiment La Chartre. 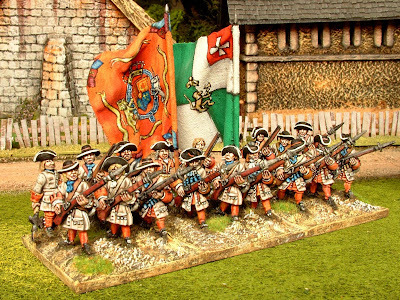 Never mind, Bob Talbot has reborn the tradition with his Prinds Georgs Warfare Miniatures battalion in green face orange. Also shown are some painted examples one being yet another incarnation in grey faced green. Take your pick.. the Danes of Prinds Georg!